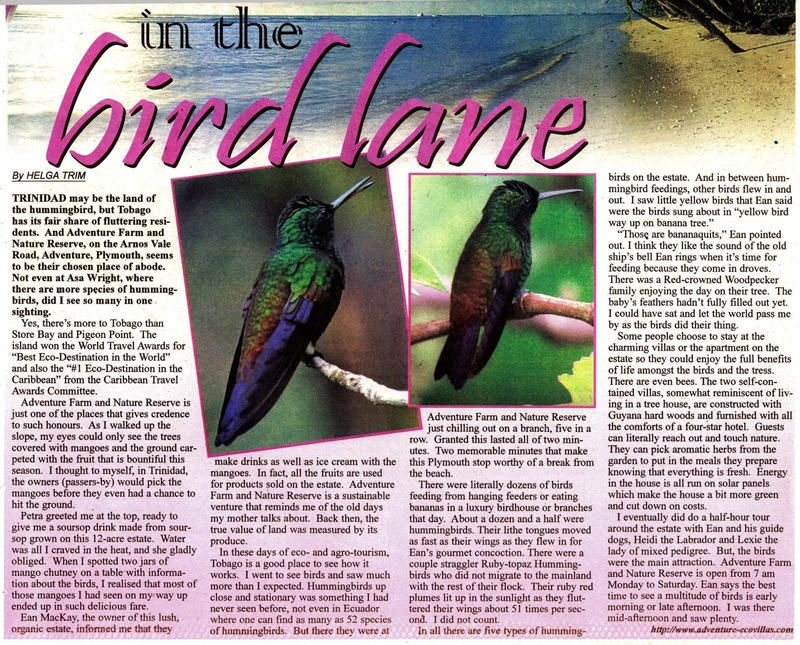 TRINIDAD may be the land of the hummingbird, but Tobago has its fair share of fluttering residents. And Adventure Farm and Nature Reserve, on the Arnos Vale Road, Adventure, Plymouth, seems to be their chosen place of abode. Not even at Asa Wright, where there are more species of hummingbirds, did I see so many in one sighting. Yes, there’s more to Tobago than Store Bay and Pigeon Point. The island won the World Travel Awards for “Best Eco-Destination in the World” and also the “#1 Eco-Destination in the Caribbean” from the Caribbean Travel Awards Committee. Adventure Farm and Nature Reserve is just one of the places that gives credence to such honours. As I walked up the slope, my eyes could see the trees covered with mangoes and the ground carpeted with the fruit that is bountiful this season. I thought to myself, in Trinidad, the owners (passers-by) would pick the mangoes before they even had a chance to hit the ground. Petra greeted me at the top, ready to give me a soursop drink made from soursop grown on this 12-acre estate. Water was all I craved in the heat, and she gladly obliged. When I spotted two jars of mango chutney on a table with information about the birds, I realized that most of those mangoes I had seen on my way up ended in such delicious fare. Ean Mackay, the owner of this lush, organic estate, informed me that they make drinks as well as ice cream with the mangoes. In fact, all the fruits are used for products sold on the estate. Adventure Farm and Nature Reserve is a sustainable venture that reminds me of the old days my mother talks about. Back then, the true value of land was measured by its produce. In these days of eco- and agro-tourism, Tobago is a good place to see how it works. I went to see birds and saw much more than I expected. Hummingbirds up close and stationary was something I had never seen before, not even in Ecuador where one can find as many as 52 species of hummingbirds. But there they were at Adventure Farm and Nature Reserve just chilling out on a branch, five in a row. Granted this lasted all of two minutes. Two memorable minutes that make this Plymouth stop worthy of a break from the beach. There were literally dozens of birds feeding from hanging feeders or eating bananas in a luxury birdhouse or branches that day. About a dozen and a half were hummingbirds. Their lithe tongues moved as fast as their wings as they flew in for Ean’s gourmet concoction. There were a couple straggler Ruby-topaz Hummingbirds who did not migrate to the mainland with the rest of their flock. Their ruby-red plumes lit up in the sunlight as they fluttered their wings about 51 times per second. I did not count. In all there are five types of hummingbirds on the estate. And in between hummingbird feedings, other birds flew in and out. I saw little yellow birds that Ean said were the birds sung about in “yellow bird way up on banana tree”. “Those are bananaquits”, Ean pointed out. I think they like the sound of the ship’s bell Ean rings when it’s time for feeding because they come in droves. There was a Red-crowned Woodpecker family enjoying the day on their tree. The baby’s feathers hadn’t fully filled out yet. I could have sat and let the world pass by as the birds did their thing. Some people choose to stay at the charming villas or the apartment on the estate se they could enjoy the full benefits of life among the birds and the trees. There are even bees. The two self-contained villas, somewhat reminiscent of living in a tree house, are constructed with Guyana hard woods and furnished with all the comforts on a four-star hotel. Guests can literally reach out and touch nature. They can pick aromatic herbs from the garden to put in the meals they prepare knowing everything is fresh. Energy in the house is all run on solar panels which make the house a bit more green and cut down on costs. I eventually did do a half-hour tour around the estate with Ean and his guide dogs, Heidi the Labrador and Lexie the lady of mixed pedigree. But the birds were the main attraction. Adventure Farm and Nature Reserve is open from 7am Monday to Saturday. Ean says the best time to see a multitude of birds is early morning or late afternoon. I was there mid-afternoon and I saw plenty.